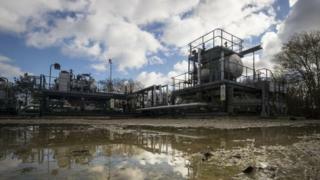 An energy company has submitted its final plans to start fracking for shale gas in North Yorkshire. Third Energy was granted planning permission for the site at Kirby Misperton, between Malton and Pickering in May 2016. The Hydraulic Fracture Plan (HFP) will be considered by the Oil and Gas Authority (OGA) and the Environment Agency. Protesters have vowed to resist the plans despite losing a legal challenge. Third Energy said it hoped to begin fracking before the end of the year. It said the process at its KM8 well, sunk for conventional gas extraction in 2013, would be carried out without disruption and with minimal impact. The HFP sets out how the company would control and monitor the process and is a condition of its environmental permit, granted in 2016. The Environment Agency said it would carry out a detailed technical assessment of the plan and would publish its decision after that had been concluded. Third Energy would then require final approval of its plans from the Oil and Gas Authority (OGA). Campaigners opposed said they were not "resigned" to fracking going ahead despite losing a legal challenge in December. Jackie Cray from Kirby Misperton, said: "I want to resist it with every breath I have. "We will be watching very closely whatever Third Energy do, both on the site and whatever they bring through the village, they will have eyes on them all the time." No fracking has taken place in the UK since 2011, when tests on the Fylde coast were found to have been the probable cause of minor earthquakes in the area. In October 2016 the government granted planning consent to Cuadrilla to hydraulically fracture exploration wells at a site in Lancashire. Campaigners lost a legal challenge to that decision in April.